Registered North Carolina home schools are offered free general admission for a self-guided tour once per year. Home schools must fill out the Home School Registration Form and bring it with them to the Aquarium in order to qualify for free admission. This includes children (K-12) in a home school family and two adults only. State issued home school documentation showing your ID number must be presented upon check-in with Visitor Services. This can include your school’s card, an official email, or an online verification sheet. Home school groups consisting of different families must arrange to arrive at the same time. Late-comers without their home school card will be charged regular admission. Wish to explore more during your visit? 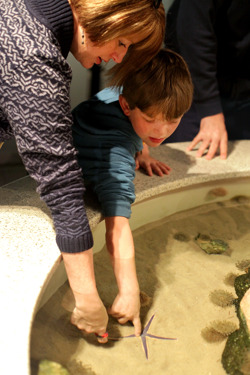 Consider one of the Aquarium's Special Activities. Special Activities may be scheduled for groups of 10 or more. If your home school group is smaller than 10, you may either join us for special activities offered to the public or plan to pay the participant price. For more information regarding Home School visits, please contact the Registrar at [email protected] or call (910) 772-0542.